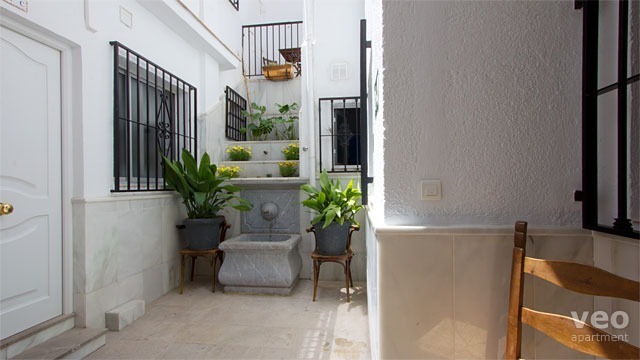 "Casa de Oro A" is a ground floor, one bedroom apartment for up to 4 guests. It is located in the lower Albaicín quarter just off Paseo de los Tristes by the river Darro, and opposite the Alhambra Palace. Refurbished in 2012, the interiors are decorated simply with a practical layout. Features include: hot/cold air-conditioning, flat-screen TV and free WI-FI internet access. The open-plan living room doubles as a bedroom and includes two single day beds and a wardrobe as well as a dining table with chairs for 4. Two windows face the pedestrian Horno del Oro street. 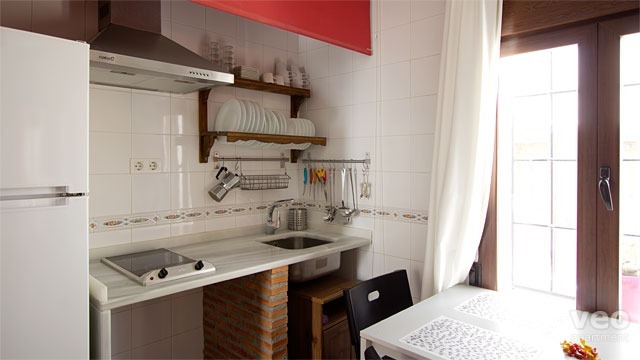 The kitchenette is equipped for self-catering and includes a microwave. There is a bathroom with shower. 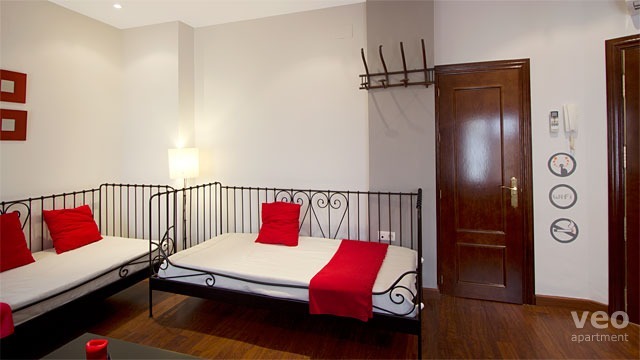 The bedroom has a double bed, a wardrobe to store your belongings and a window facing the street. "Casa de Oro A" forms part of a house made up of 7 holiday apartments. The main city sights and attractions are a short walk away. The Albaicín is a colourful and charming traditional neighbourhood set in the very heart of Granada. 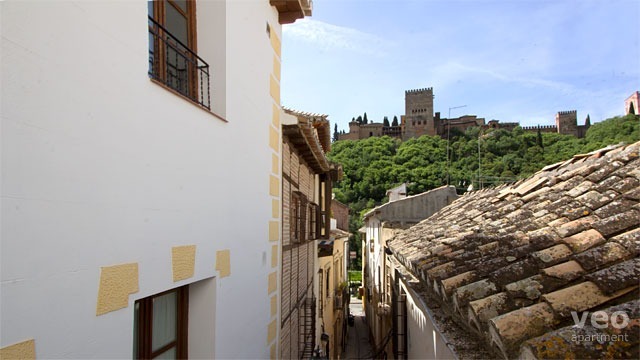 Made up of a network of winding streets and small squares rising up on a hill facing the Alhambra, the area is bordered by the Darro River and by the commercial centre of the city. Once the site of the Moorish citadel, the Alcazaba, the area still retains a sense of its past in its architecture - many of the churches were built on the foundations of mosques. Today, parts of the Albaicín have taken on a distinctly North African feel with many tearooms and small shops selling Morroccan goods. Wander through the streets and you'll find wonderful views, a wide variety of restaurants and many terrace bars - where you get a free tapa with your drink as is the custom in Granada. For the best view in town, head for the lively Mirador de San Nicolás where you can contemplate the whole of the Alhambra with the peaks of Sierra Nevada as a backdrop. As the poet said, "Give him charity, girl, as there is nothing worse in life than being blind in Granada"! Albaicín Old moorish quarter in Granada. Tearooms and arab shops. Network of winding streets. San Nicolás' Mirador. 14:00 - 22:00h. Early check-in is possible but subject to availability - please enquire. Late check-ins after 22:00h have an additional charge of 25 EUR. Daily rate:16,50 EUR. Reduced price at car park "Trex". Located at 15 min walking from the apartment. Internet: Free! Wireless internet free of charge. Estaba todo muy bien. Lo único es que pienso que levantaba algunos detalles de limpieza. No estaba sucio pero era mejorable.